We cannot help but look again at Umberto Ciceri‘s works; actually, they solicit the spectator to some kind of coation to look again, a compulsion of the gaze that shows itself in the sideways motion of the body, from the right to the left and back, a perpetual vision which renews itself every time we are in front of them and try to understand with a single view what cannot be limited to a unicum. Surely, this “compulsion” belongs traditionally to the Op Art and to the Kinetic art since the Fifties, with different modalities depending on the situations: if the work itself is in motion or if it starts moving when the spectator passes by, exploiting the weaknesses of the sight and the adjustments of the eyes before unaligned planes, false alignments and perspectives. Unlike the Programmed art which historically " in the ideological climate of the second avant- garde movements " showed the will of a cultural zero-grade, that is, no possibility of symbolic interpretation but only the use of univocal signs (lights, lines, breakdowns, sequences, etc), the lenticular works by Ciceri are loaded with a cold conceptual burden capable of reducing the influence of the lyricism peculiar to his poetics, so to weaken the aesthetic force which, on the one side, is emphasized by the abstract part and, on the other side, risks to jeopardize the contemporary result in the most figurative and narrative parts. On the contrary, the narrative subtext works as a keel, in order to lower the focal point of the work, so that the floating flatness of the surface is anchored to the bottom, behind the glasses and the lenses. The moving images of the boxing referee who counts a knock-out, or of a ballerina‘s pirouette, are the emotional bait of a thousand-year old reasoning underlying our philosophy and civilization: there is the Being and the Becoming, there is Eternity and Time. Perhaps the solidity of the being is only illusory or, on the contrary, the becoming is merely superficial, everything flows or everything stands still. In the perpetual repetition of the same movement " the referee who will never count to more than three, the ballerina who will only have room for a half spin " we seem to watch the staging of the eternal return, as imagined by Nietzsche who described it as “the heaviest of burdens”. “If every second of our lives recurs an infinite number of times " quoting Milan Kundera " we are nailed to eternity as Jesus Christ was nailed to the cross. It is a terrifying prospect. In the world of eternal return the heaviest of burdens”. So the heaviness of the “es muss sein”, “it must be so”, imagined by Beethoven in the last movement of his last quartet, is a sort of categorical imperative underlying our fate, so that even if we could eternally repeat our lives, they would return in the same way with the same mistakes; they would be irredeemable. But there is also the lightness, expressed in the motion of the greatest ballerina ever, Majja Michajlovna Plisetskaja, caught still in her pose, forced to repeat her gesture in a few frames forever, a formal perfection beyond words, because, as Eliot wrote: “Only by the form, the pattern, can words or music reach the stillness, as a Chinese jar still moves perpetually in its stillness”. Indeed, the figure dancing on the jar, thanks to the form, is still and yet in motion and the lenticular medium intensifies this dilemma. The second part of the work presented by Umberto Ciceri in London concerns the Universal Declaration of Human Rights, whose 70th anniversary will be celebrated on 10th December. 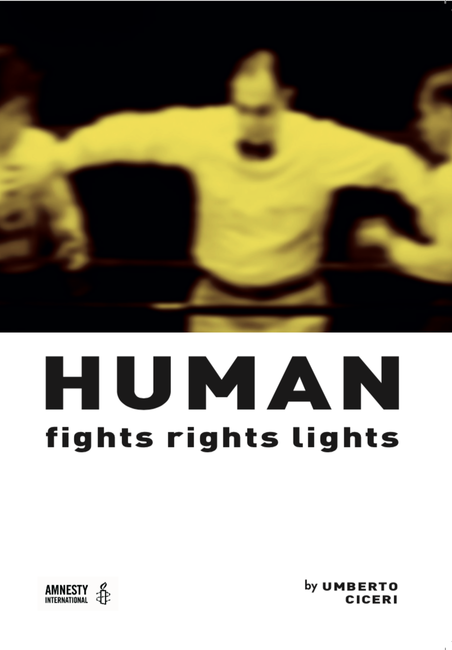 It is a greatly evocative triptych (fights, rights, lights) with a refined poetic strength, made of three videos in which the 30 articles " that vividly elevate the basic rights of our civilization and that, in their laic version and in a universal key, according to the compilers‘ intentions and hopes, should comprehend or should have comprehended all human groups and nations, regardless of political ideologies, regimes and religions " are recited. As for all declarations of this kind, besides the highly moral and civil contents, the prose is often emphatic and magniloquent, in-between the formal strictness of law and the predictable enumeration and, for this reason, even more so, Ciceri‘s mythopoetic force seems glorifying, aiming at recreating the Declaration and at presenting it in the form of art. 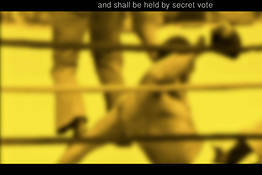 In the first act, Ciceri gathers a number of famous boxing knock-outs from the Fifties, especially Rocky Marciano‘s; he turns them into sparkling yellow images while a speaker, shouting with the same passion of the original one, follows the match by reciting the text of the articles, so that the excitement of the verbal text as a sports commentary coincides with the images of the final moments of the match and, in the apex of the reciting, it is not clear if the guardian of the rights is the losing or the winning part. In the second act, the construction is more daring and almost moving in its multisensorial beauty: the German version of the Declaration has been put to music on Bach‘s cantatas, keeping the counterpoint, and it is recited by four voices: soprano, contralto, tenor and basso, filmed by a camera and then blurred until they almost become ghosts. Finally, the third act proposes again Ms. Plisetskaia‘s dance, whose movements are tuned with the heartbeats which, in turn, translate the articles of the declaration, until they merge into a single sound, an almost celestial harmony of the universe.